Farmer Palmer’s Farm Park is a Childrens Farm near Poole in Dorset. It is winner of National Farm Attraction of the Year Award 2006 and it’s easy to see why. The park is designed for children aged 8 years and younger. Although older children are welcome the park is not really designed for older children. Really it should say that it is designed for children aged between about 2 and 8, but that doesn’t stop the younger children enjoying it, including our 1 year old daughter. Although there is less available for the under 2’s she still had a great time. We went to farmer palmer’s on a wet day. Normally that would be enough to cancel any planned trips to a chldren’s farm or similar place. Many of the activities are indoor. You have to walk outside to go between the different barns, and there are other outdoor activities, including a maze, some animals and the tractor ride, but most is indoors. There is a barn full of bales of hay, which are carefully positioned with slides. The Hay is very stable and everything feels very safe, all that is apart from the idiot stood just outside the barn full of hay smoking. There was a separate smoking area away from the main barns, but despite this being an obvious safety aspect at least one smoker decided to ignore it. Unfortunately you can’t legislate against some people, fortunately there weren’t any problems this time. The barn appeared to be very popular with the children, but with quite a number of different slides around the place there were plenty to go around. Opposite the hay barn is the tractor barn. 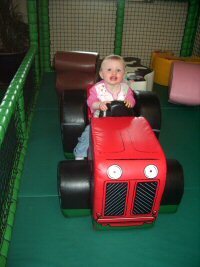 This had a area for driving sit-on tractors, which included an indoor and outdoor part making it suitable whatever the weather. The barn also housed a bouncy castle, a swing (for younger children only), and a large and small ball pool. The main attraction of the farm is the adjacent animal barn. Here some young cows, goats, sheep and other animals are housed. When we visited we were lucky to see some baby lambs that were only one week old. Our daughter even had a chance to stroke one of the young lambs, although she found some of the bigger animals a little scary. She liked them from a distance but didn’t want to get too close. There are various events throughout the day. We went to the holding of the Guinea Pig session which was popular with the younger children. The main attraction was feeding time for the young goats. This was a entire show in it’s own right. There was a large area where children could sit on the bales of hay in a large rectangle. Some of the children were given bottles of milk to hold (all had an opportunity at one point) and then the goats were released into the area. They came running into the area and then went to one of the bottles of milk where they were fed by the children. The goats were then led or carried away ready for the next tribe of goats. After they had all been fed then the goats were all allowed back into the area where the could be stroked. The whole event was very good and gives the children something to remember. The final barn contained a restaurant and ball pool area. The restaurant was very good, and had a very good choice of meals for children. The restaurant included a large area for leaving buggies / push chairs and plenty of high chairs. There was also a play corner for younger children featuring some large foam animals and a tractor (see the top photo). The ball area in the restaurant barn included bridges, and climbing areas, and was designed for children aged about 5 to 8. The baby changing facilities were excellent, clean and tidy. They even included pictures on the ceiling to distract the children and had seats and tables available. All in all I was very impressed with the whole place. I’d certainly recommend it to anyone with children aged 8 and under. This entry was posted on Friday, September 29th, 2006 and is filed under Babies, General, Tourism. You can follow any responses to this entry through the RSS 2.0 feed. Both comments and pings are currently closed.